Pennsylvania is a surprisingly large state with some major cities that could easily support a very healthy poker economy whether it be regulated or offshore. While regulated Pennsylvania online poker isn not available quite yet because the enabling legislation for it was just recently passed in late 2017, offshore gaming certainly is available now. Pennsylvania is open to all of the major US-facing sites, and with the way things have been growing on these sites of late, there is little doubt that these are better than what you would be able to find on any kind of regulated site. Below is a great list of the collection of online poker sites Pennsylvania residents can play. Each of these sites offers something a little bit different, and all offer great opportunities for players! Furthermore, we have done the due diligence for you and weeded out all of the shady poker sites with sketchy business practices and sub-par withdrawal speeds. What Online Poker Sites Can I Play in Pennsylvania? There are many possibilities for real money gaming online from within Pennsylvania, which means that it's not easy to identify the premier sites for poker. We've gone through all the data carefully to craft a shortlist of recommended operators. Regardless of which of the below poker rooms you join, you'll be able to enjoy a variety of games and stakes, the rapid payment of your winnings, and fair randomization of the deal. Read through this information, and then you'll be able to make an educated decision. Ignition Poker is the largest online poker site that Pennsylvanians can sign up for, so you'll probably have no trouble finding a game you want to play. You'll receive a 100% up to $1,000 bonus with your first deposit. The bonus is worth 30% rakeback or even more depending on the types of poker you play. You'll encounter cash tables of NL Hold'em, PL Omaha, and PLO/8 from $0.02/$0.05 up to $10/$20, and there are also limit games (Hold'em and Omaha8) up to $30/$60 as well. Ignition has a type of fast-fold poker, called Zone Poker, and it's the only poker room open to Americans that sees significant action in this type of game. When you fold your hand in Zone, you get a new hand at a new table right away, so you don't have to sit around waiting for another set of hole cards. There are sit n' gos from $1 + $0.05 to $200 + $14, including a few non-standard offerings, like Beginners tourneys that pay out a larger portion of the field than is standard and Triple-Ups, which reward the top third of the entrants with triple their buyins. Multi-table tournaments guarantee $1.5 million per week. The weekly highlight is the $150 + $12 $100,000 guaranteed, which runs on Sunday at all PaiWangLuo Network sites. If this isn’t enough for you, stay on the alert for special MTT series, like the Black Diamond Poker Open, that distribute multiple millions of dollars to the winners. You can play at Ignition from a Windows or Mac. Additionally, there's a mobile app that works with almost any modern computing device. The Ignition Casino is also mobile-compatible, and it has hundreds of games for you to enjoy. At the same time that you get your poker bonus, you'll also receive a 100% up to $1,000 casino bonus. Click on our banner above to go to Ignition and open up your account today. If you'd rather read more information first before signing up, then check out our Ignition Casino Poker review. The Chico Poker Network, including Sportsbetting.ag, operates one-stop gambling shops, which have casino games, sports wagering, and financial betting in addition to poker. You're probably most interested in the poker side of things, and when you make a deposit, you'll get a 100% up to $1,000 bonus to use in the poker room. Ring game fans will find NLHE and PLO starting from $0.05/$0.10 and topping out at $10/$20. This site has a heavier concentration on full-ring games than most competing entities, which is why we named it the top internet poker room for nine-max poker. There's a Bad Beat Jackpot at specially marked tables of $0.50/$1.00 and higher that allows you to collect a nice chunk of change if you should be fortunate enough to participate in a qualifying hand. The BBJ has hit for $990,000 USD recently. The newest addition to the cash game roster at the Chico Network is Boost. In Boost, you get a new hand immediately upon folding, cutting down drastically on the time it takes to play hands. There's only one stake level for Boost currently offered: $0.05/$0.10. The sit-and-go lobby here is surprisingly active with games denominated from $1.05 to $200 + $215. Don't neglect the Windfall Poker section because these three-handed events give you the opportunity to compete for up to 2,000 time the amount you pay to enter. Multi-table tournaments are a bit less exciting because most of them have buyins of $22 or less with correspondingly small prize pools. There is, however a $90 + $9 Main Event on Sunday, which pays out at least $50,000. On the last Sunday of each month, this tournament grows to a $100 + $9 buyin and a $100,000 guarantee. The poker lobby is available to users of Macs and PCs via a downloadable application. There's also mobile app for iOS and Android that offers an experience very close to that of the regular poker client. Whatever interface you log in through, you'll receive extra credits to your account in a number of ways. As you play, you'll accrue comp points that can be exchanged for tournament buyins at a rate of about 5% of the rake you pay. Moreover, there are daily challenges for cash games and leaderboards for SNG that you can strive for each week. They're good for a combined total of nearly $13,000 weekly to the fortunate winners. To join up at Sportsbetting.ag today, click on the banner link above. For additional details about the poker service, peruse our honest and accurate SB.ag review page. If you're curious about an alternate site on the Chico Network, there is another high quality site on this network open to PA residents called BetOnline, and you can read our BetOnline Review here..
As a member of the same network that Ignition Poker is on, Bovada boasts all the same ring games and tournaments as its partner site. In addition, Bovada lets you bet on sports and races, which is not possible at Ignition. Somewhat compensating for this advantage is the fact that the poker bonus at Bovada is only half the size as that at Ignition: 100% up to $500. The sportsbook is rightly centered around major U.S. sports leagues, like the MLB, NBA, and NFL, but it also contains a fairly broad listing of other types of contests from around the world, such as golf, tennis, and soccer. If you enjoy making additional wagers while the action on the field is happening, then Bovada's Live Betting area will probably please you. You'll pick up a 50% up to $250 sports bonus upon making your first deposit, and this free cash is boosted up to a max of $500 if you fund your account with bitcoins. The racebook awaits you with its selection of almost 200 tracks in the United States, United Kingdom, Ireland, and South Africa. Straight wagers and exotics are both supported, and you'll get full track odds on whatever bets you make. You can box and wheel your bets to increase you chances of walking away a winner. Racebook action counts fully for clearing your sports bonus. While the majority of the titles in the Bovada Casino are identical to those at Ignition, Bovada does have a few extras up its sleeves. There are leaderboards that cost nothing to join and give you the possibility of scoring some free bonus money if you best the other players. Furthermore, there's a Live Dealer section that houses games operated by actual human dealers with the gameplay streamed right to your system over the internet. You can open up your Bovada account right away by following our link above. For more information on this online gaming operation, head over to our Bovada Poker review. Although Intertops is mostly known as a sportsbook, it does offer a poker solution, hosted on the Horizon Poker Network. This network is a bit on the smaller side, so it doesn't have a ton of games going at once. It compensates for this drawback with a full roster of promotional deals, including a 200% up to $1,000 poker bonus for first-time depositors. When you look at the ring game section of the poker software, you'll see a bunch of tables active at $50nl and below with occasional running games above this cutoff. There are sometimes low-stakes PLO and PLO/8 games going too. It's the same story in the sit n' go lobby with contests above $5 rarely starting up. There are more multi-table tourneys to be found, chiefly at smaller price points, but with a few higher competitions present too. The most notable daily event is the $15 + $1.50 Sundowner, which pays out at least $1,000 and starts up at several different times to cater to users in numerous parts of the world. On Sunday, all Sundowners are replaced with a single $25 + $2.50 MTT that awards a prize pool of $4,500. One of the pluses of Intertops is the fact that it hosts satellite events to major live tournaments in locales around the world. There are usually a series of low-priced steps to the final, so you can qualify for a trivial investment. Enticing overlay opportunities sometimes present themselves, and social media promotions provide the ability to earn a ticket for free. Your bonus of up to $1,000 will clear at approximately 27% rakeback equivalent, and you'll also score 36% dealt rakeback on all your play when you sign up using our links. Reload bonuses abound, so even after you're finished with your welcome bonus, you'll still be able to grab additional free money. There's a $4,000 rake race each week along with a loyalty tiers program to grant you perks for your regular play. When you initially fund your account, you'll get 50 free spins to use in the casino. If all of the above sounds nice to you, then press the “Visit Site Now” button above. You can enlighten yourself further about what to expect by browsing through our Intertops Poker review. The Winning Poker Network and its ancestor Yatahay Network have been providing U.S.-friendly poker online since 2001. There have been a lot of improvements in the software and traffic levels over the years, and so when you join the top site, Americas Cardroom, you'll benefit from smooth gameplay and the second-largest player liquidity among all U.S.A. poker sites. Take advantage of the 100% up to $1,000 bonus to pad your balance to the tune of 20% rakeback, and you'll also collect a $50 free credit. If tournaments are your thing, then you'll have no reason to regret registering for an ACR account. The weekly Sunday Major is called the Sunday Special. It charges entrants $200 + $15, and it pays out $150,000+, making it the largest regularly scheduled tourney event in the American market. You can also partake in the recurring Million Dollar Sunday: a chance to win your share of a seven-figure prize pool for just $500 + $40. There are also MTT series a few times per year, like the Online Super Series. SNGs are spread in a variety of formats, including two that are unique to the WPN: SNG 2.0 and Jackpot Poker. Both of them combine traditional poker with randomized elements to generate prize pools that fluctuate wildly and generate excitement. If cash is more your cup of tea, then you'll appreciate the range of stakes available for NLHE, PLO, and PLO8: from $0.01/$0.02 through $25/$50. There are Limit Hold'em, Limit O8, and Seven Card Stud tables also. The Beast is a points leaderboard that rewards ring game aficionados while Sit & Crush fulfills the same role for SNGers. Both of them feature cash prizes and satellite tournament entries, distributed every week, and neither of them extracts anything from you beyond a portion of the normal rake/fees that you pay. Combine them with payouts from the Elite Benefits system, and you'll see your profitability rise without your even doing anything special. Following the link above will permit you to create your Americas Cardroom account without delay. If you want to learn more first, then it might be worthwhile to examine our diligently compiled ACR overview page first. Just as every poker network does, the WPN incorporates the efforts of several different companies in order to craft a robust poker platform that's superior to what each member could achieve on its own. You may prefer to play at one of the other reputable network sites besides Americas Cardroom: BlackChip Poker (read review) and True Poker (read review). If you're a seasoned poker lover, then you might be looking for rakeback, in which case we've prepared instructions for getting set up with a Winning Network RB deal. The Grand Network is the newest institution on our list, but there's a good reason why it should be treated as a respectable online poker operator rather than an unknown and fledgling entity. It's the creation of the seasoned 5Dimes group, the overseer of top-rated sports and casino brands for longer than a decade. This firm's reputation for no-nonsense payments and superb customer service is legendary in the industry. The one issue with 5Dimes is a lack of player volume. This has an upside though: Because the room is virtually ignored by professional pokerists, the games you do find tend to be populated by weak and clueless opponents. You can tango with them at blind levels between $0.05/$0.10 and $1/$2 in cash games and in tournaments up to $5.50. In fact, the tourney scene might be the strongest point of this network. You see, there are a few MTTs each day that don't rake off any house fees. This is wonderful for your bottom line because the normal 10% fees that other rooms charge won't come out of your ROI here. Even if you have $0 to your name, you can still succeed at Grand because there's a $500 freeroll every Sunday that lets you start from the ground up. The normal rake is already pretty low, but you'll reduce it even further through the 50% rakeback that the site offers. Now is a fine time to sign up at 5Dimes, and you can accomplish this by clicking on the link above. Or take a glance at our Grand Poker review for additional info on the network. All of our partner poker sites are excellent, and it's impossible to say that any single one of them stands above any of the rest. Depending upon your personal playing habits and preferences, a certain room may be superb for you but unsatisfying for your neighbor. There's no exact science to choosing a poker operator, but we can inform you of a few considerations you may wish to think about while pondering which site is right for you. ⊙ If you want to sample the games at the busiest poker sites, then Ignition, Bovada, and Winning stand head-and-shoulders above the others. ⊙ If bonus value is what you're after, then Ignition and Horizon.both have rapidly clearing $1,000 offers. ⊙ If you appreciate steady rewards over time, then Horizon's Loyalty Levels and WPN's Elite Benefits certainly fit the bill. ⊙ If you'd like to be able to play from whatever device you have handy, then check out Chico, Ignition, Bovada, and Grand because they have solutions for many types of hardware. ⊙ If you enjoy non-standard games, then perhaps Ignition's Zone Poker or one of the Winning Network's SNG variants is worth playing. ⊙ If you understand the positive impact that rakeback can have on your results, then sign up at Horizon for 36% or Grand for 50%. ⊙ If you like to dabble in sports or casino betting, then you'll be pleased by the gambling lineup at Bovada, Chico, Horizon, and Grand. Online poker cash moves to and from Pennsylvanians without trouble regardless of which of the above sites they call home. There are numerous methods for both deposit and withdrawal, including credit cards, money transfer services, and Bitcoin. It is this last option that's best for almost everyone because BTC lets you avoid burdensome cashout fees while greatly speeding up the process of receiving your money. If you're uncertain of how Bitcoin works and how you can take advantage of it, then read our page describing how to set up Bitcoin wallet and exchange accounts. The parts that apply to poker are (2), (3), and (4). Looking closely at the wording here, we see that only those who facilitate games are targeted by the law. You, as an individual online poker player, have nothing to worry about legally unless you try to set up games or solicit others to participate in them. In the Watkins case, the defendant was organizing and hosting poker games, and this is what got him in trouble. Other laws prohibit manufacturing or possessing gambling equipment, pool selling and bookmaking, conducting an unauthorized lottery and similar activities. Most of these infractions are misdemeanors of the first degree, which can be punished in Pennsylvania by imprisonment for up to five years and/or fines of up to $10,000. There's a separate part of the PA Consolidated Statutes that applies to regulated real money gaming overseen by the state. These details are contained in Title 4 - Amusements, Part II - Gaming. This behemoth collection of chapters follows a pattern we've seen with many other states: The restrictions that apply to authorized gaming are minutely spelled out, and little seems to be left open to interpretation. 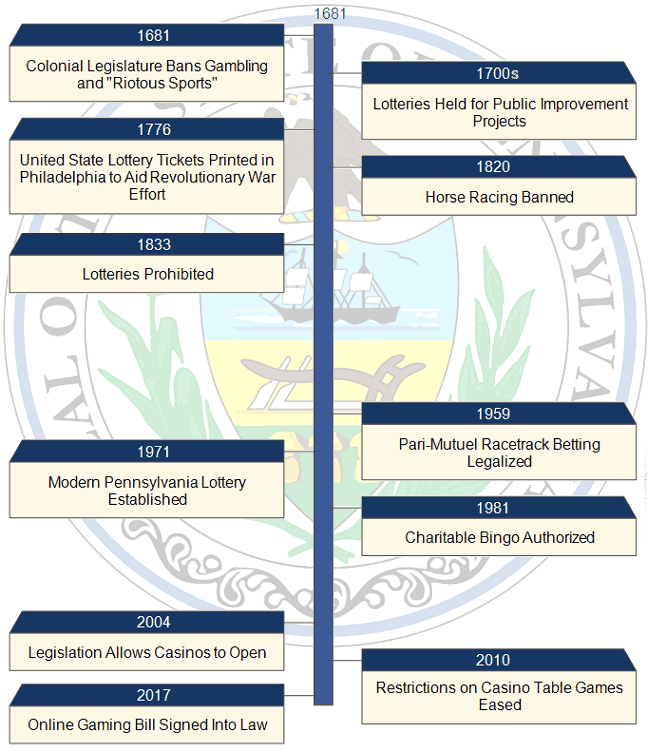 Some of the subjects covered are the composition and duties of the Pennsylvania Gaming Control Board, licensing procedures, types of games allowed, testing of casino machines, and enforcement. Consequences for breaking the rules depend on the severity of the offense and whether or not it’s a first-time violation or a repeated breach. They may include revocation of the license, the issuance of a cease and desist letter, and fines that can climb higher than $1 million. The attorneys that the offshore poker operators have retained seem to have advised them that they're not likely to face any legal problems serving the Keystone State. We're only making an educated guess here, but the facts speak for themselves – hardly any internet poker companies refuse to accept Pennsylvanians as players. This means you'll be able to sign up at any one of a number of poker rooms or indeed multiple sites. Pennsylvania was one of the original 13 states of the United States, but unlike the others, it was run by Quakers. This religious sect had a dim view of gambling and merry-making in general. Indeed, Pennsylvania's founder, William Penn, referred to the Puritans, who inhabited much of New England, as “revelers.” Shortly after the creation of the colony in 1681, the legislature banned not only gambling but also “riotous sports” because of the link between sport and real money gaming. However, the British, who had ultimate authority over Pennsylvania and the other colonies, consistently struck down these and other bans. In any event, the lure of being able to raise money without levying taxes proved difficult for the authorities to resist. There was a lottery in 1747 to establish defenses during King George's War and another one in 1754 to generate funds for expanding the Academy at Philadelphia (today's University of Pennsylvania). When the States declared independence from the United Kingdom, there was a great need to finance the new Continental Army. Philadelphia was the seat of the Continental Congress, and it was in this city that tickets for the United States Lottery were printed up and sold. After the war, though, the Quaker State returned to its anti-gambling ways. Yet, horse racing was usually exempt from these rules, and George Washington himself reportedly attended meetings of the Philadelphia Jockey Club where money undoubtedly changed hands on the outcomes of the races. This loophole was closed in 1820 when the state banned horse racing altogether. For the remainder of the 1800s, the only gambling to be found was in unlicensed and illicit saloons and parlors. It's perhaps fitting that the last form of wagering activity to be prohibited was also the first to be reinstated although it took quite a while. In 1959, PA began to allow pari-mutuel betting on racetrack results. The Pennsylvania Lottery came next in 1971. Charitable bingo was permitted starting in 1981. It was about time that the game was legalized in the state as it was in Pennsylvania that Hugh J. Ward (a native Pittsburgher) first standardized modern bingo. He had observed it being played at fairs and wrote the official rulebook for bingo in 1933. In 2004, legislation passed that allowed casinos to open up. Some of them are existing racetracks that added slots to become “racinos” while others are standalone sites. In 2010, the restrictions against table games were lifted, allowing blackjack, roulette, and of course poker to appear at these venues. These establishments have proven very popular, allowing Pennsylvania to overtake New Jersey for the #2 spot in state gambling revenues behind Nevada. In 2017, a bill was approved by the legislature and signed by the governor to allow licensed entities to offer online poker in Pennsylvania along with casino table games and slots. The Quaker State thus joins Delaware, Nevada, and New Jersey as the fourth legalized internet gaming jurisdiction in the U.S.A.
As of August 2018, nine casino operators in the state have submitted their applications to transact over the internet. None of them have been approved so far, but it's only a matter of time before the Gaming Control Board issues the appropriate licenses. We foresee that it will take a while before the legalized online poker scene in Pennsylvania picks up any steam, so we predict that there will remain a generous space for offshore sites in the meantime. There have been several proposed bills to legalize online poker in PA over the past few years, and 2017 was the year that it finally happened. H271 passed both the House and Senate of Pennsylvania, and it was duly signed into law on Oct. 30 by Governor Tom Wolf. There are a few factors that may make it difficult to establish a workable PA internet poker market, including the fact that the tax rate for online slots is set at a hefty 54% notwithstanding that the rate for poker and other peer-to-peer games is a more reasonable 16%. Be that as it may, this state is a prime candidate to become a leader in state-supervised online gaming. Its population of 13 million makes it the largest state to have thus far enacted real money online gambling legislation. There's already a healthy brick-and-mortar betting economy, and we'll probably see many familiar casino names jumping eagerly into the online arena. There are about a dozen casinos in Pennsylvania, divided up between racinos, casino resorts, and standalone casinos. At the racinos, you can also engage in pari-mutuel racetrack betting. There are no tribal gambling opportunities anywhere in the state. Charitable associations are allowed to host bingo games subject to certain limitations and licensing requirements. You can play the Pennsylvania Lottery and participate in the multi-state games that it offers, like Powerball and Mega Millions. Most of the brick-and-mortar locations for real money betting have onsite poker rooms, and the largest of these is at Parx Casino in Bensalem, just outside of Philadelphia. Its 80 tables feature No Limit Hold'em up to $10/$25, LHE as high as $40/$80, PLO, LO8, and mixed games. There are high hand giveaways, bad beat jackpots, and low-priced tournaments four times a week. If there is legalized online gambling in Pennsylvania, it should be a rather lucrative market with a lot of natural competitors that know what they are doing from the land-based casino realm. This means that the citizens of Pennsylvania will get a good and experienced online site that will rival that of the other states already available but with much better liquidity due to the overall size of the population of the state. Pennsylvania isn't necessarily the first state people think about when poker comes up, but its residents are no stranger to the card game. 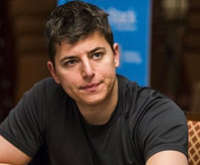 Perhaps the most successful of them has been Jacob “Jake” Carl Schindler, from Bryn Mawr, who has made a name for himself on the high-roller circuit. Jake's first major poker success came in 2013 when he triumphed in a World Championship of Online Poker event at PokerStars under the screenname “CaLLitARUSH,” earning about $150,000. Yet, he ran afoul of the site's management who contended that he broke the terms of service by playing for real money from within the United States. Schindler denied these allegations, but his account was nevertheless terminated and $250,000 seized. Jake was thus forced to concentrate his play at live tables, and the change seemed to have agreed with him. Among his victories are a win in the 2014 $25,000 + $250 PCA High Roller event in the Bahamas, worth $1.2 million, and a first place finish in the 2018 partypoker MILLIONS Barcelona €100,000 + €1,000 Super High Roller contest in which he collected €1.75 million (approximately $2.2 million). Other stratospheric tourneys in which he has achieved final table results include the 2017 Super High Roller Bowl at the Aria in Las Vegas, the 2014 Seminole Hard Rock Super High Roller in Florida, and the 2017 WPT Five Diamond World Poker Classic High Roller Event at the Bellagio. Each of these tournaments cost at least $25,000 to enter. In total, Jake Schindler has earned more than $20 million during his live tournament career. Something that's missing from his resume, though, is a World Series of Poker bracelet, which has eluded him thus far despite his 30 cashes in WSOP MTTs. As of August 2018, Jake is only 28 years old, so there's still plenty of time for him to work toward this goal. John Hennigan, who hails from the City of Brotherly Love, is from an older generation of poker players, having been born in 1970. Nicknamed “Johnny World” because of his reputation for being ready to bet on anything in the world, he took up pool when he was young and used his betting skills to become a pro on the billiards table. In the late '90s, Hennigan realized that the income he could make as a pool hustler wasn't enough to get by on, so he made the transition to poker. After cashing in World Series events in 1997 and 1999, he picked up his first bracelet in the 2002 $2,000 HORSE tournament along with $117,320 in prize money. As commendable as that performance was, it paled in comparison the money up for grabs a decade late after the poker boom had gotten underway. He cashed in the $50,000 Poker Players Championship – often considered by insiders to be the “real” annual poker Main Event – in 2012, 2013, 2014, and 2018. In 2014, he won it for $1.5 million. John has 44 WSOP cashes to his credit along with a couple dozen profitable results in other tournaments, including a WPT victory at the 2007 Borgata Winter Open in Atlantic City. His overall brick-and-mortar tourney winnings exceed $8.1 million. In 2018, John Hennigan received the honor of being inducted into the Poker Hall of Fame. The laws on online poker in Pennsylvania don't exactly permit the activity, but all charges are directed at the operators of the games. Regular, everyday players, like yourself, have no need to worry. The only concern in your mind should be finding a stellar Pennsylvania online poker site to play at, and you can do so without any hassles by following our advice above. If you are lucky enough to have another address in a nearby state, be it your business address, summer home, second apartment, family home, etc, you may have other online poker options available to you. Here are a list of the states that border Pennsylvania and Professional Rakeback's review on each of them: Connecticut, Delaware, Maryland, Michigan, New Jersey, New York, Ohio, Virginia, and West Virginia. You don't have to restrict your quest for knowledge to these particular states because we've written an overview of the U.S.A. internet poker scene for all states. Rather than keeping what you've learned to yourself, you can tell your friends and relatives about this page and share it with them. They'll then have a chance to alleviate their ignorance about online poker and the sites that accept citizens of Pennsylvania. The Pennsylvania online poker environment is quite complex, and so it's only natural for you to still have questions about it. Below, we've compiled a list of popular questions and answers for you to gain knowledge from. Are there state-regulated online poker rooms in Pennsylvania? The Pennsylvania legislature passed H271 in October 2017, which set up a framework for legalized online poker and casino gaming. As of August 2018, nine casinos have applied for interactive poker licenses, but none of them have opened up as of yet. How does the licensed PA internet poker market work? In order to apply for online poker licenses, qualifying entities must pay a fee of $4 million. If they wish to obtain three-in-one licenses covering poker, slots, and casino table games, then they have to hand over $12 million although discounted combination licenses were available for just $10 million during a limited introductory period. Online poker revenue is subject to a 16% tax. Slots, though, are taxed at a 54% rate, raising doubts as to the long-term viability of the entire internet gambling market because many of the organizations that are interested in providing poker are also keen on recouping their investments through slot machine profits. Instate brick-and-mortar casinos have first dibs on the licenses, and any that remain unclaimed might be offered to outside groups. Is it legal to play at an offshore poker site in Pennsylvania? Pennsylvania's anti-gambling laws don't criminalize the act of playing poker over the internet. Federal laws don't apply either because the Department of Justice found in 2011 that the Wire Act is only intended to combat sports betting, not lotteries, poker, or any other type of real money gaming. Therefore, it's perfectly legal to enjoy a game of cards on your PC within Pennsylvania. Is it legal to play at PokerStars in Pennsylvania? Yes, it's not against the law to sign up and play at PokerStars. Yet, you can't do so at real money tables because 'Stars has only made available its play money games to residents of the Keystone State. The reason for this is that the company was targeted in the Black Friday crackdown on online poker in 2011. As part of the settlement it reached with federal authorities, PokerStars had to pay a massive fine, and it agreed to exit the U.S. market except in those states where it holds a license to operate. The only state where PokerStars is legally permitted to offer its services is New Jersey. 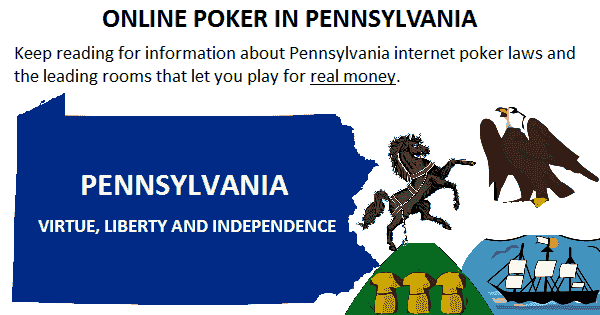 Is Ignition Poker legal in Pennsylvania? Ignition Casino Poker is part of the PaiWangLuo Network, which is headquartered in Hong Kong. It's therefore not subject to U.S. law, and the management of the company would likely contend that it's acting completely legally in the United States. Ignition conducts its business with an understanding of international rules that allow member parties to trade with each other's citizens. Is BetOnline operating legally in Pennsylvania? BetOnline is a Panama-regulated entity, and it therefore complies with all the legal requirements of that jurisdiction. The United States has argued in the past that such sites are illegal, but it has lost World Trade Organization judgments time and again. The WTO has decided that it is the USA that's breaking the law by blocking gambling firms' access to its consumers, which is against its treaty obligations. Is Global Poker a legal site in Pennsylvania? Global Poker states that its sweepstakes poker arrangement keeps it in compliance with all relevant state and federal laws. However, we think there are many holes in this argument. Space doesn't permit us to go into all the specifics here. You can look through our review of the site for further information. What's the minimum gambling age in Pennsylvania? The Commonwealth of Pennsylvania has set a minimum gambling age of 18 for most forms of gambling but 21 for casinos and poker rooms. These same rules transfer over online, so you ought to be 21 to be in full compliance with Pennsylvania law when you log on for a session of online poker. However, the poker sites aren't realistically able to keep abreast of age of majority rules in thousands of jurisdictions around the world, so they'll allow you to sign up and play as long as you're over 18. It's up to you to ensure you're following the rules. If you're under 18, we advise you not to open an account at any online gaming site because you might have trouble with identity verification documents when you attempt to withdraw your winnings. Can I run my own gaming company in Pennsylvania? If you endeavor to get into the gambling business in Pennsylvania, we counsel you to obtain the proper licenses and paperwork first. Otherwise, you could face serious charges. Just look at the case of Tony Zenner who was arrested in July 2018 in connection with at least 142 illegal gambling devices that he installed in retail establishments in the state. Do I owe taxes on my internet poker winnings? Gambling income is treated as taxable by both the Internal Revenue Service and the Pennsylvania Department of Revenue. Unusually, Pennsylvania even makes non-residents pay tax on any gambling winnings they collect from within the state's borders. The amount of your tax liability will depend on several factors, including your level of annual income and your tax filing status. You can discuss these matters with a CPA or qualified tax attorney if you have further questions about your tax obligations on poker winnings. Can I play online poker on my Mac? Most internet poker rooms focus mainly on Windows users, but this doesn't mean Mac enthusiasts are left out in the cold. There are a number of sites, like Ignition, Bovada, and Sportsbetting.ag, that have deployed dedicated Mac poker software. Even at other sites that don't especially cater to the platform, you may be able to use a browser-based client to access the games. Finally, many users have reported success in running the regular Windows executable on their Macs via Parallels or other emulation solutions. For more info, check out our Mac poker page. Tablets and smartphones are proliferating throughout our society, and internet poker organizations have taken note. A growing number of them are providing special apps to cater to these devices. For example, the Chico Poker Network and the Grand Poker Network have downloads for mobile systems. Other sites, like Ignition, Bovada, and Intertops, maintain web interfaces that you can browse to from your phone or tablet to access the poker action. How does depositing and withdrawing money work at PA online poker rooms? Depositing money with your credit card and requesting your withdrawals by check is the standard way of mobbing cash around at internet poker sites. However, the advent of crypto-currencies like Bitcoin has largely done away with this cumbersome way of transacting. While it is possible to conduct all your transactions via legacy mechanisms, most rooms prefer that you fund your account and receive your cashouts through digital coins. These cryptos let you bypass the hidebound, inefficient banking sector to, in effect, become your own bank. They permit low-fee transactions with an enviable level of anonymity. In addition to Bitcoin, several “altcoins” have been gaining prominence in the world of online gaming. You can find out more about a couple of them in our Ethereum gambling page and our Bitcoin Cash online poker guide.